Oregon sheriff John Hanlin posted Sandy Hook truther video on Facebook. 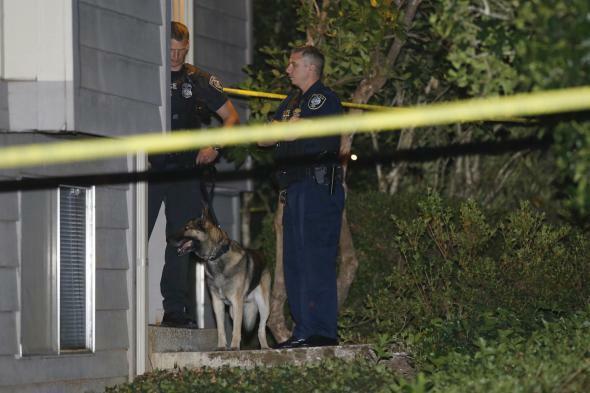 Police investigators in Roseburg, Oregon on Thursday after the mass shooting at Umpqua Community College. Update, 2:35 p.m.: Mother Jones reports that Douglas County sheriff John Hanlin, who helped supervise the response to yesterday’s shooting and spoke to members of the press in Roseburg, once approvingly posted a conspiracy theory video on Facebook which asserted that public appearances by the parents of children killed at Sandy Hook were actually performances by actors. Original post, 11:39 p.m.: Here’s the latest on the massacre at Umpqua Community College in Roseburg, Oregon in which 26-year-old Chris Harper Mercer killed nine people before dying after a shootout with police. The father of a student wounded in the attack, Anastasia Boylan, says his daughter told him that Mercer asked Christian students in her classroom to stand up, then shot those who followed his instruction. An 18-year-old student named Kortney Moore gave a similar account. A “long-dormant” dating profile linked to Mercer disparaged “organized religion,” the New York Times reports. Local sheriff John Hanlin wrote a letter to Joe Biden in 2013 asserting that “gun control is NOT the answer to preventing heinous crimes like school shootings,” Mother Jones reports. The letter was part of a wider campaign involving law enforcement officials who oppose federal gun control efforts. A CBS reporter says one of the guns found at the scene of the massacre is registered to someone besides Mercer. Reports are circulating that one of the injured victims, a 30-year-old named Chris Mintz, is an army veteran who was shot while confronting Mercer, but those reports seem to be based on the accounts of Mintz’s relatives rather than Mintz’s statements or those of witnesses. We’ll update this post as more information emerges.